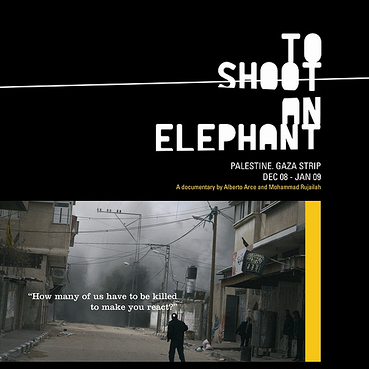 To Shoot an Elephant is a licensed documentary directed by Alberto Arce and Mohammad Rujailah about life on the Gaza Strip. This hard-hitting film has already gained international acknowledgement and awards such as the “Most Innovative Filmmaker” at Florence’s Festival dei Popoli. Despite the Israeli ban on foreign correspondents and humanitarian aid workers to cover and witness operation “Cast Lead” on the ground, there was a small group of international volunteers that managed to remain present in Gaza when the bombing started on December, 27th 2009. To Shoot an Elephant is therefore a collection of stories gathered by the only foreigners who decided and managed to stay embedded inside Gaza strip ambulances, with Palestinian civilians. Backtrack on the last four decades; Gaza Strip’s situation has not been a pleasant ride; from being under the Israeli occupation until January 2006, when the Israelis imposed a total siege on its 1.5 million inhabitants. This was the country’s attempt to strangle the strip’s economy and to undermine the Hamas’ (ruling political party) government. Then on December 20, 2008, the six month truce between the Israeli and Hamas ended leaving Gaza Strip as a battle ground for an uprising war. The documentary shows more than just moving stories from different sectors of society. It opens up with a long queue of Palestinians waiting for food, followed by an image of a United Nations relief warehouse that had stopped giving goods. These contrasting images are very powerful, as the inactivity of the warehouse and the long line of hungry people presents us with the seriousness of the humanitarian crisis. The scenes are heart-breaking. Whether it’s the once flourishing olive plantation turned into a barren buffer zone or a playground dripping in civilian blood due to sporadic mortar hits. This is one of the most striking statements in the film because it came from the point of view of a normal citizen. This showed how the war affected civilians trapped in between two conflicting factions. I admire how the film let the images speak for themselves. It doesn’t talk a lot or force opinions. It shared an impartial and honest look on the life of Palestinians during the attacks of Israelis. Overall, To Shoot an Elephant focuses on the Palestinian’s struggle to live a normal life. The stories presented are extremely moving, you can really feel the tough conditions and the unbearable fear in the air. Hands down to the people who have risked their life in making this excellent film, you showed the world that being a journalist is not just a profession; it’s the urge to tell the truth. The documentary is available as a free torrent download.